This is incredible. The Smithsonian has released a new 3D modeling tool, complete with scans of some of its most famous objects. The scans themselves are pretty gorgeous, with aerial and rotating views (check one out below the fold), but the coolest application is that you can use it to 3D print your own artifacts. What should we make first? So far they've released 21 scans (with approximately 137 million more objects to go...), but it's already amazing. Here's a short collection of things you can start printing: the Wright brothers' plane, a whale fossil, a Eulaema bee, Amelia Earhart's flight suit, Abraham Lincoln's life mask, a complete Wooly Mammoth, a Pergolesi Side Chair, the Gunboat Philadelphia, and a CasA Supernova remnant. You can print them to any scale, so feel free to make that Wright Brothers plane to fit on your desk and the Eulaema bee into the largest, most terrifying lawn ornament in the world. The Smithsonian has already cited the potential education and research applications of the program, which is right and true. But, folks, the sheer number of things we could do with this is insane. We could build a whole mini-backyard Smithsonian. We could construct a scientifically-accurate (and fully-sized) T-rex skeleton. We could print off and then wear the Hope Diamond(s). Tell us in the comments below your ideas for what to do and what in the Smithsonian you're hoping they scan next. Via Smithsonian Magazine's Around the Mall blog. 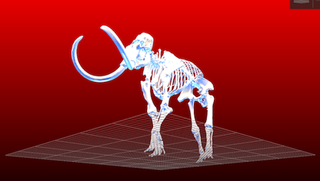 Images created using the Smithsonian's X3D application, which is terrific fun, and which you can beta test now, here.